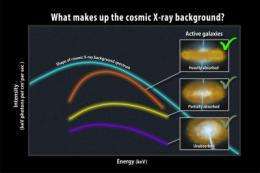 (PhysOrg.com) -- Seen in X-rays, the entire sky is aglow. Even far away from bright sources, X-rays originating from beyond our galaxy provide a steady glow in every direction. Astronomers have long suspected that the chief contributors to this cosmic X-ray background were dust-swaddled black holes at the centers of active galaxies. The trouble was, too few of them were detected to do the job. An international team of scientists using data from NASA's Swift satellite confirms the existence of a largely unseen population of black-hole-powered galaxies. Their X-ray emissions are so heavily absorbed that little more than a dozen are known. Yet astronomers say that despite the deeply dimmed X-rays, the sources may represent the tip of the iceberg, accounting for at least one-fifth of all active galaxies. "These heavily shrouded black holes are all around us," said Neil Gehrels, the Swift principal investigator at NASA's Goddard Space Flight Center in Greenbelt, Md., and a co-author of the new study. "But before Swift, they were just too faint and too obscured for us to see." The findings appear in the Feb. 10 issue of The Astrophysical Journal. Most large galaxies contain a giant central black hole, and those observed in the Swift study weigh in at about 100 million times the sun's mass. In an active galaxy, matter falling toward the supermassive black hole powers high-energy emissions so intense that two classes of active galaxies, quasars and blazars, rank as the most luminous objects in the universe. The X-ray background led astronomers to suspect that active galaxies were undercounted. Astronomers could never be certain that they had detected most of even the closest active galaxies. Thick clouds of dust and gas surround the central black hole and screen out ultraviolet, optical and low-energy (or soft) X-ray light. While infrared radiation can make it through the material, it can be confused with warm dust in the galaxy's star-forming regions. However, some of the black hole's more energetic X-rays do penetrate the shroud, and that's where Swift comes in. Since 2004, Swift's Burst Alert Telescope (BAT), developed and operated at NASA Goddard, has been mapping the entire sky in hard X-rays with energies between 15,000 and 200,000 electron volts -- thousands of times the energy of visible light. Gradually building up its exposure year after year, the survey is now the largest, most sensitive and most complete census at these energies. It includes hundreds of active galaxies out to a distance of 650 million light-years. From this sample, the researchers eliminated sources less than 15 degrees away from the dusty, crowded plane of our own galaxy. All active galaxies sporting an energetic particle jet were also not considered, leaving 199 galaxies. Although there are many different types of active galaxy, astronomers explain the different observed properties based on how the galaxy angles into our line of sight. We view the brightest ones nearly face on, but as the angle increases, the surrounding ring of gas and dust absorbs increasing amounts of the black hole's emissions. Astronomers assumed that there were many active galaxies oriented edgewise to us, but they just couldn't be detected because the disk of gas attenuates emissions too strongly. "These extremely obscured active galaxies are very faint and difficult to find. Out of a sample of 199 sources, we detected only nine of them," said Davide Burlon, the lead author of the study and a graduate student at the Max Planck Institute for Extraterrestrial Physics in Munich. "But even Swift's BAT has trouble finding these highly absorbed sources, and we know that the survey undercounts them," Burlon explained. "When we factored this in, we found that these shrouded active galaxies are very numerous, making up about 20 to 30 percent of the total." "With Swift we have now quantified exactly how many active galaxies there are around us -- really, in our back yard," said Marco Ajello at the SLAC National Accelerator Laboratory, Menlo Park, Calif. "The number is large, and it agrees with models that say they are responsible for most of the X-ray background." If the numbers remain consistent at greater distances, when the universe was substantially younger, then there are enough supermassive black holes to account for the cosmic X-ray background. The team then merged Swift BAT data with archived observations from its X-Ray Telescope in an effort to study how the intensity of the galaxies' emissions changed at different X-ray energies. "This is the first time we could investigate the average spectrum of heavily absorbed active galaxies," said Ajello. "These galaxies are responsible for the shape of the cosmic X-ray background -- they create the peak of its energy." All of this is consistent with the idea that the cosmic X-ray background is the result of emission from obscured supermassive black holes active when the universe was 7 billion years old, or about half its current age. That, sir, is neutron repulsion in action! How do you conclude that these are X-rays emitted from neutron stars rather than black holes? Seen in X-rays, the entire sky is aglow. Even far away from bright sources, X-rays originating from beyond our galaxy provide a steady glow in every direction. Oddly, this seems to remind me of the paradox proposed, I think, by Edgar Allen Poe, in which we ask, "if the universe is uniform and infinite why is the night sky dark?" The night sky isn't dark at all. The "light" just is in the wrong wave length. Observations such as this would seem to support the infinite universe theory after all. 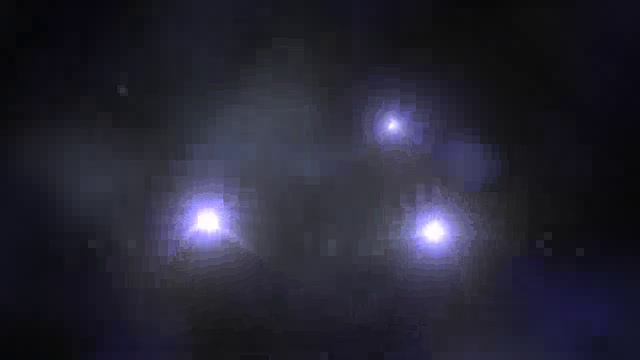 These heavily shrouded black holes are all around us,"
If this is the case, it would easily explain any apparent "holes" in the "Light" coming from outer space. "The universe is infinite, you just can't tell it with the naked eye. The EM radiation from distant objects is too dim and in the wrong spectrum to "see", plus some light is "lost" because it was reflected or absorbed by bodies, or fell into black holes along the way." No. The question of the night sky is in regard to a universe that is infinite in TIME as well as SPACE. Since the Universe is not infinitely old the question does not apply. But fun aside, if the Universe is infinite in terms of SPACE, then, most logicaly, it should also be infinite in terms of TIME (eg. "infinitely old"). And as far as Olbers "paradox" goes, that's something a 5 year old infant would normally ask, because, yea - simple logic leads to simple reasoning - can't really blame the kid :-) Though the answer should be quite clear to anyone who at least partially grasps the fundamental implications of the relative aspect of the Universe. you mean like 6000 year old? Since when did you jump on that kind of a boat? How many infants are five years old(answer=NONE) and how many REAL five year olds are child prodigies? Did YOU learn to read Latin at three and English at 3.14596? I sure as hell didn't. Then again I am not actually sure about hell except in the negative sense. If we define openness as being without borders (lower-dimensional manifolds like the 2-sphere in 3-dimensional space) then there is no implication of an infinite (n-dimensional) volume. A sphere is a closed space. It has a positive curvature. The universe appears to be flat. Which is why I said it is open and thus does not have boarders. If it has boarders then it isn't open. If space has a positive curvature then it isn't open. So far it looks flat. I see at least one boarder in time. In the past. The boarder in time for the future is Time Like Infinity or you could call it The End Of History but that has an unfortunate political history. Timelike Infinity is still infinite in space over time. Not now but over time. Of course Inflation could have been going on for an infinite time. But that is speculation to at least the second power. Almost all galaxies grow from within, from new matter ejected from the non-singularity, non-black, black-holes. (Does nature really have to conform to the math limitation?) Thus, confirming a larger population of these objects shrouded within galaxies is further confirmatory evidence for a non-inflationary model. There is no need to invent dark matter, dark energy, curvy, stretchy spacey stuff. Science needs to get a grip on reality.